There is seemingly a bottomless well of nonsense on disasters and climate change. I have long ago accepted that such nonsense is, like the presence of arguments rejecting the basic science of climate change, a situation to be lived with rather than changed. Even so, I can still poke some fun. Climatewire reports uncritically a claim coming from Swiss Re that "the financial toll of global weather disasters amounts to between 1 and 12 percent of U.S. gross domestic product annually." This totals $160 billion to almost $2 trillion. Reality Check: The actual number for global losses as a percent of US GDP is closer to 0.1%, with the maximum about 1.2% in 2005. The total cost of all hurricanes since 1900 in normalized dollars is about $1.4 trillion. The media (in general) rarely question numbers given to them from the reinsurance industry and on disasters and climate change have a strange aversion to the peer reviewed scientific literature. Innumeracy. NOAA Administrator Jane Lubchenco and NCDC head Tom Karl write in Physics Today about the 14 "billion dollar disasters" tabulated by NOAA for 2011 and ask "Why did we see such expensive damage last year?" Their answer, predictably, includes "climate change" and is followed by a lengthy exposition on why NOAA needs more money. Reality Check: Lubchenco and Karl somehow failed to note that NOAA and NCDC have cautioned against drawing any such conclusions from the "billion dollar disasters." And even though Lubchenco and Karl cite the recent IPCC Special Report on Extreme Events, they also somehow forgot to mention this part: "Long-term trends in economic disaster losses adjusted for wealth and population increases have not been attributed to climate change, but a role for climate change has not been excluded." Deceiving. Swiss Reinsurance and the Reinsurance Association of America teamed up yesterday with a few US Senators to call for the US government to adopt policies to protect their industry from extreme events resulting from climate change. They also ite the NOAA billionz analysis and explain via press release ""From our industry's perspective, the footprints of climate change are around us and the trend of increasing damage to property and threat to lives is clear," said Franklin Nutter, president of the Reinsurance Association of America." Reality Check: The ability of the reinsurance industry to accurately reflect the state of the science of disasters and climate change has long been questionable. The industry is currently awash in money, a condition that Guy Carpenpter characterized just a few months ago as "the reinsurance sector remains adequately capitalized with a significant excess capital position" (PDF). In such a context, when reinsurers ask the government to take on some of their risks justified by "climate change," you should hold tight to your wallet. Conflicted. 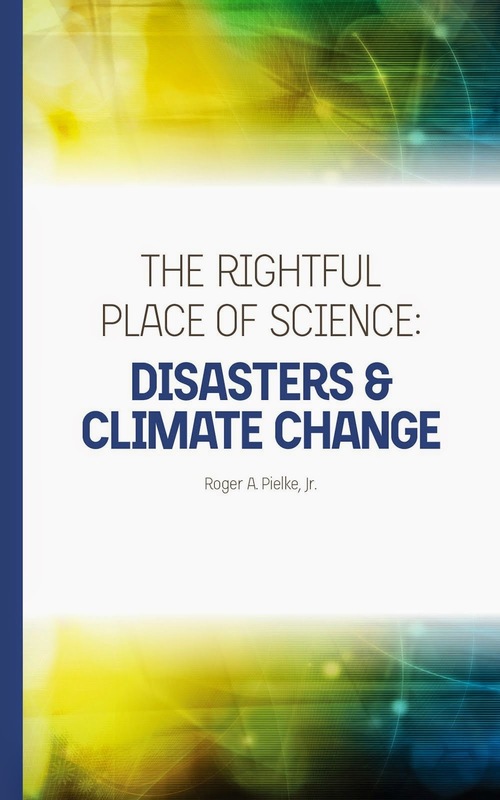 For anyone who is interested in the actual science of disasters and climate change, I'll be speaking on the subject later today here at CU (for others, just have a look at TCF, chapters 7 and 8).